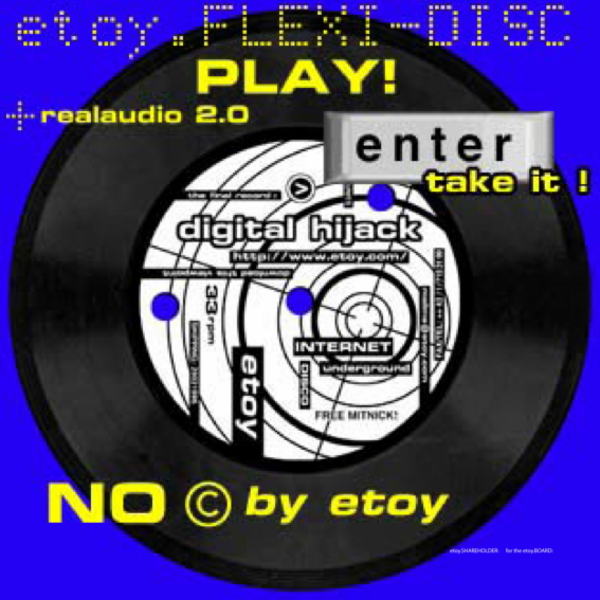 etoy shipped 10.000 UNITS of the digital hijack flexi disc (a very cheap and low tech foil record / used as special form of advertisement in magazines in the 80s ) as a kind of flyer to all the internet cafes, computer, internet and art magazines and to selected addresses around the world. the trash retro product was labeled "the last record by etoy". it held the short version of the terrorist message to the digital hijack (one of the demands was to free kevin mitnick, the hacker), the description of what the digital hijack was and the soundtrack of the digital hijack release. the flexi disc material is very delicate, after listening to the message a few times the record self-destructs...just like secret agent messages written with special ink.